1 Reykjavik, Iceland (CNN) - For more than 50 years Iceland has been decreasing its dependence on fossil fuels by tapping the natural power all around this rainy, windswept rock of fire. 2 Waterfalls, volcanoes, geysers and hot springs provide Icelanders with abundant electricity and hot water. 3 Virtually all of the country’s electricity and heating comes from domestic renewable energy sources – hydroelectric power and geothermal springs. It’s pollution-free and cheap. 4 Yet these energy pioneers are still dependent on imported oil to operate their vehicles and thriving fishing industry. 5 Iceland’s geographic isolation in the North Atlantic makes it expensive to ship in gasoline – it costs almost $8 a gallon (around $2 a liter). 6. Retired University of Iceland Professor Bragi Arnason has come up with a solution: Use hydrogen to power transportation. Hydrogen is produced with water and electricity, and Iceland has lots of both. 7 "Iceland is the ideal country to create the world’s first hydrogen economy," Arnason explains. His big idea has earned him the nickname "Professor Hydrogen." 8 Arnason has caught the attention of General Motors, Toyota and DaimlerChrysler, who are using the island-nation as a test market for their hydrogen fuel cell prototypes. 9 One car getting put through its paces is the Mercedes Benz A-Class F-Cell – an electric car powered by a DaimlerChrysler fuel cell. Fuel cells generate electricity by converting hydrogen and oxygen into water. And fuel cell technology is clean – the only by-product is water. 10 "It’s just like a normal car," says Asdis Kritinsdottir, project manager for Reykjavik Energy. Except the only pollution coming out of the exhaust pipe is water vapor. It can go about 100 miles on a full tank. When it runs out of fuel the electric battery kicks in, giving the driver another 18 miles. Filling the tank is similar to today’s cars – attach a hose to the car’s fueling port, hit "stars" on the pump and stand back. The process takes about five to six minutes. 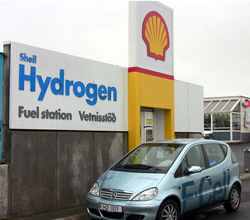 11 In 2003, Reykjavik opened a hydrogen fueling station to test three hydrogen fuel cell buses. The public buses could run all day before needing refueling. CNN international, September 20, 2007. Rédigez en français un compte rendu (200 mots environ, +/- 10%). Vous veillerez à dégager les éléments essentiels, dans un français de qualité, et indiquerez le nombre de mots utilisés.